Learning basic arithmetic in a fun and engaging way. 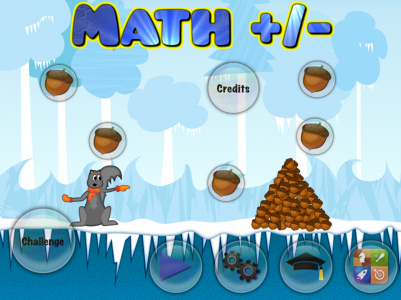 Math Plus Minus is the second educational app from pkclSoft. After the success of Tap Times Tables, one of the most frequent requests was for a similar app for the younger kids who aren’t yet up to their times tables. Math Plus Minus is built on the solid foundations that Tap Times Tables has provided in that the look and feel of the game are very similar, as is the game play. This way, when your younger children progress from addition and subtraction to their times tables, there will be a familiar environment waiting to help them. Math Plus Minus allows your kids to practice basic addition and subtraction by asking simple questions, and providing multiple choice answers. You have complete control over how many questions make up a game, and how large the numbers are that comprise the questions. You can choose to play simple addition, subtraction, or a mixture of both in one game. Because this game is built for the younger kids, you also have the ability to turn off the timer completely; allow them to take as long as they want! Math Plus Minus is a Universal app, and will run equally well on your iPhone, iPad, or iPod Touch. It requires IOS 4.0 or later to run. Every question is displayed in a nice friendly manner on the screen, and the four possible answers are pumped out onto the screen, ready for tapping. Tapping an incorrect bubble does not move you onto the next question until you’ve made three mistakes. Math Plus Minus is well paced, especially in timed mode. My 10 year old got hooked by the timed mode straight away. In timed mode, the faster you answer, the higher your score. When not playing timed mode, scoring is simpler, but still helps to motivate your kid to try harder. In addition to the main game, there is also a second game that is a bit faster paced, and aimed at those kids that want a bit more of a challenge. The faster you answer, the higher your score! As you finish off a screen full of answers, if there are more questions, then more answers will pop into view. On the options screen, you have the ability to set the level of the questions, and how many. Just drag the spinning bubble to where you want it to be. Tapping on the button will toggle negative numbers on or off. When this is turned on, the answer to a question is allowed to be negative. This is for the older kids that understand this concept. It’s turned off by default. Tapping on the button will toggle the timed mode. In timed, mode, each question is given around 15 seconds to be answered in the main game. In the challenge game, questions are always timed. In timed mode, fter the 15 seconds, the player can still answer, however no points are earn’t. Please, if you have suggestions on ways to improve or enhance this game contact me via the support email address at the top of this page. If you would like to see Math Plus Minus available in another language, please let me know as I would be more than happy to add other languages as time and resources permit.